The GRVC projects, and particularly the projects led by the GRVC researchers, have concluded with significant success developing worldwide first technologies and demonstrations and their results have obtained several awards. Thus in the COMETS project it was demonstrated the coordination of heterogeneous Unmanned Aerial Systems and its application to the detection and monitoring of forest fires. In the AWARE project it was demonstrated for the first time world wide the transportation of a load, that a single helicopter cannot transport by payload limitations, by means of three autonomous helicopters physically connected to the load. Moreover this project demonstrated the deployment of a wireless sensor network by means of the autonomous helicopters and the join operation of Unmanned Aerial Systems with wireless sensor and actuator networs in disaster management and filming applications. The results of the project were awarded with the second EUROP-EURON technology transfer award in 2010. In the ARCAS project the first aerial robots in the world with 6 and 7 degrees of freedom robotic arms have been demonstrated for assembly applications. ARCAS also demonstrated new perception and planning techniques for aerial robotics assembly. In the EC-SAFEMOBIL it has been demonstrated for the first time the fast autonomous landing of a robotic helicopter on a mobile platform without GPS and using a tether to compensate perturbations. EC-SAFEMOBIL also demonstrated new estimation, control, trajectory generation and task allocation for multiple autonomous systems, by including autonomous tracking of multiple targets with multiple UAVs by avoiding collisions between them. GRVC researchers have developed innovative technologies for rotary wing (helicopters and multirotor) and fixed wing unmanned aircraft systems including fault detection and reconfiguration, detect and avoid systems, navigation in GPS denied areas and simultaneous localization and mapping (SLAM) based on cameras and range sensors, and aerial robotics manipulation. The GRVC researchers have also developed new methods for the coordination and cooperation of multiple UAS, including cooperative surveillance, detection, monitoring, tracking and manipulation, and for the cooperation of UAS with ground systems including wireless sensors and actuator networks and unmanned ground vehicles. 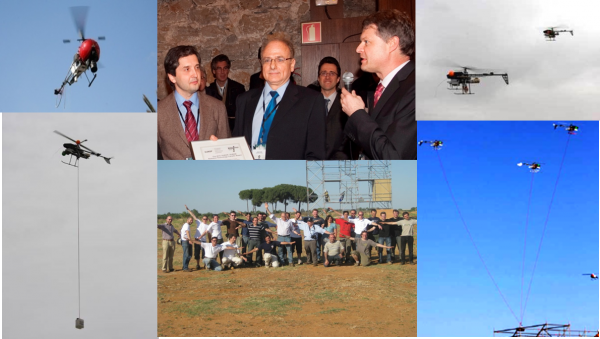 The video “10 years on the cooperation of multiple unmanned systems” was finalist in the award “Specific major achievement/milestone in intelligent robotics and/or intelligent systems research in the last 25 years” of IROS 2012. Currently, the GRVC researchers are developing new multimedia interfaces for multiple unmanned aerial systems and air to air refueling of unmanned aerial vehicles. GRVC has also developed innovative technologies for unmanned ground vehicles and mobile robots for industrial applications including the development of fully autonomous vehicles, localization and SLAM for ground vehicles, and autonomous navigation and transportation. Moreover, coordination and planning methods for multi-vehicle ground systems and for the cooperation of aerial and ground vehicles have been also developed.